Sunshine Tiki is the Host and proprietor of the Zen Tiki Lounge. Having grown up in hawaiian shirts and sunny Southern California he has a natural love of tiki, exotica music and most things mod or kitsch. 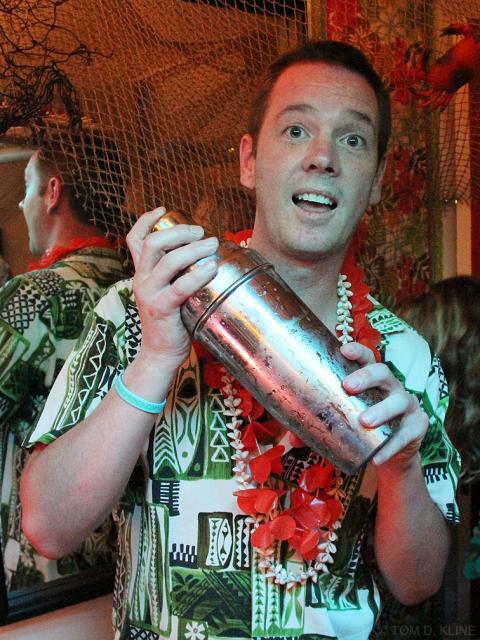 He enjoys planning and hosting tropical shindigs and helping others do the same. For the past 10 years Sunshine has been the most consistent voice behind the microphone of the ZTL podcast. "In addition to living a totally fabulous tiki lifestyle, I am a frequent visitor of the Las Vegas strip. There are always new hotels and bars opening in Vegas, you have to try to see them all before something else changes. There are few things I enjoy more than spending a few hours at a great craft cocktail bar in sin city while playing video poker and letting a great bartender surprise me with his or her signature libations." If you see me at an event or gathering please introduce yourself. The best part of hosting this podcast is meeting people and talking about our experiences. I love people. If I had just one wish, it would be to make the cocktail party a renewed favorite pass time across the globe.